Altamira Fine Art is pleased to present the first major solo exhibition for David Grossmann at our Jackson gallery July 17-29, 2017. Following several successful group shows, "In Search of Stillness" will feature over 25 new oil paintings that highlight the artists signature style and favorite subject matter - as well as explore new palettes and techniques. A glimpse into the artists process will be available at the show's opening, where studies and in- progress images will be shown along with the larger works. David's ethereal interpretations of Mt. 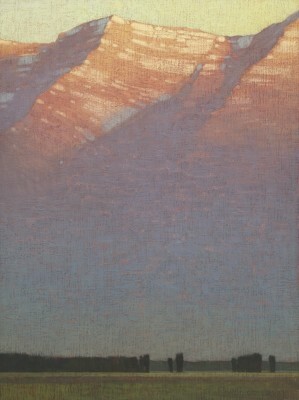 Moran and the Tetons will be a highlight in the new exhibition. His thoughtful use of color and simplified shapes breath new life into quintessential Wyoming scenery. The artist often paints on location, with studies used as references for bigger pieces, finished in the studio. In Search of Stillness will include larger works than previously shown, with canvases measuring up to 60 x 40 inches. David's popular deer and aspen paintings provide the perfect visual for the show's title and theme, In Search of Stillness. A quiet grace is evident throughout David's luminous works, and the beauty that he conveys has a meditative quality that draws the viewer in again and again. 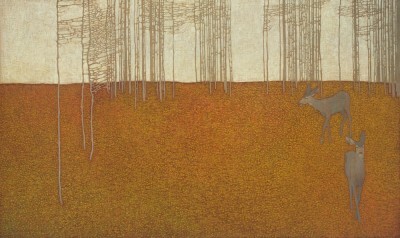 David Grossmann was born in Fort Collins, Colorado, in 1984. He was raised in Chile, where his family lived until he was 14, before returning to Colorado. Grossmann later studied at The Colorado Academy of Art in Boulder. Using a gentle, glowing palette, Grossmann paints abstracted visions of forests that are melodic in their focus on rhythm and symmetry. 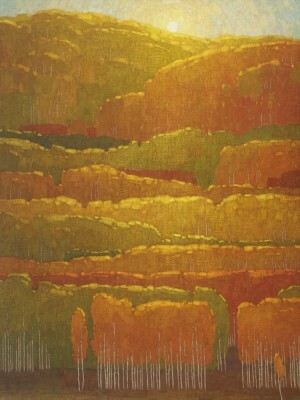 Sprawling swaths of landscape transform into flat, smooth planes, while scattered trees lend a profound sense of depth. These contrasting perspectives set the works slightly off-balance, sending the eye on an endless quest to consolidate them. "When I paint en plein air, it gives me the opportunity to absorb a sense of place and a sense of being there," Grossmann said. "I hope that sense of place and the emotion I feel when outdoors comes through to the viewers." 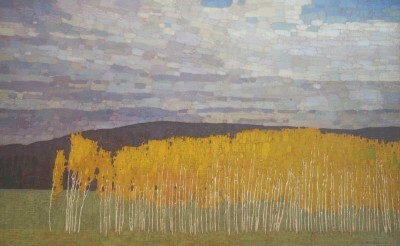 David Grossmann is an award winning artist whose work has been exhibited nationally in top shows including the Coors Western Art Exhibit and Sale, Oil Painters of America Western Regional Exhibition, American Impressionist Society National Juried Show, Salon International, California Art Club Annual Gold Medal Exhibition and the Maynard Dixon Country Invitational. Southwest Art Magazine featured Grossmann as one of their "Artists to Watch" and his work has been featured in national publicaitons including Plein Air and American Art Collector magazines, and the 2015 book, Artists of the Grand Teton National Park. Most recently, Grossmann was the recipient of the presitigious Artists Choice Award in additon to the Southwest Art Award of Excellence at the 2016 Coors Western Art Show & Sale in Denver, CO.